In a bombshell interview to Voice of American Creole Wednesday, Kenneth Merten made it clear to those who are asking President Jovenel to leave office: "This is why we have elections, so that, if the people are not satisfied they can elect other people in office." The former US Ambassador to Haiti and current Special Coordinator for Haiti at the U.S. Department of State literally told the street opposition to President Jovenel Moise and his government that Washington will not support their illegal actions. "Haiti is preparing for elections in the coming year," Merten said, "I cannot imaging that the State of Haiti can prepare elections with all this disorder in the streets." "I know that the grand majority of Haitians would prefer to go to a voting booth to vote for or against the government, not in the streets." 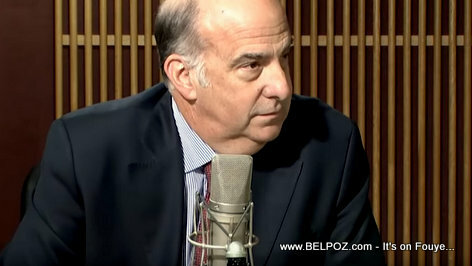 Kenneth Merten who is carrying the "Washington" message said he cannot understand exactly what these people creating chaos in the streets really want for Haiti. "What do they want Disorder? Less investments? Less jobs?" He encourages the opposition, "If you really have a problem with the way things are being done in Haiti, go to elections, do it in that fashion!" "The United States does not like to see violence happening in Haiti," Mertain said. "We agree, if the people are not happy, if they have a problem with the government then can protest, but peacefully." Try saying that to the opposition! "There is no excuse for violence and assault on the people. At the end of the day it's BAD for Haiti." "There is a government in Haiti, President, Senators, Deputes, ASEC, CASEK, they are the ones who have the responsibility to do their jobs and they cannot do it in a climate of intimidation and violence," Kenneth Merten said. "We are satisfied with the work the Haitian police is doing to maintain law and order in the country." "We notice there are gangs in Haiti confronting each other, gangs motivated and funded by other actors," criminals Merten calls these people who are funding gangs operating in Haiti. "But this something that happens not just in Haiti but in other countries as well." Sure. "When the next elections!" You and I and most of Haiti knows that the US controls the results of elections in Haiti. By the way, the opposition is not about ruling the country.